What Is The Rice Experiment? The first time I did the rice experiment, I didn’t tell my wife and kids what I was doing; I put the two jars on the kitchen counter and all I said was, “I’m doing an experiment”. One jar was labelled with the letter “H” and the other, with the letter “L”. The experiment ran for 2 months. Then, satisfied with the results, I decided to let them in on the details of the experiment. I gathered my wife and kids in the kitchen, told them that both jars were exactly the same two months ago, but now one is yellow and the other one is white. 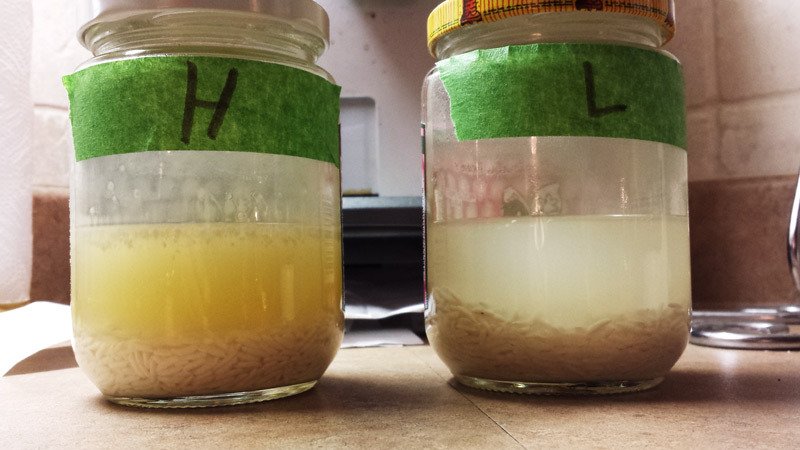 The jar with the letter “H” had gone moldy while the other, with the letter “L” was still healthy. Every day, I said “I hate you” to the jar with the letter “H” and “I love you” to the jar with the letter “L”. I remember my wife’s face cracking up into laughter, bent over with hands on belly, she said, “you were talking to the jars?”. After letting her calm down a bit, I said “imagine the implications on our life’s and to our kids”. That’s when her expression quickly changed from laughter, to neutral, and then to tears in her eyes as she started to understand the grandeur and implications of the results. Because you will operate at a new level in life after you prove to yourself that it works. It’s the simplest and most powerful experiment, that I can think of, to demonstrate the power of your thoughts. To bring awareness that you are more than the physical body and the mind. There is more to this Universe than the five senses. To teach others about the power of intentions. This is also a great experiment to perform with kids or even in a classroom environment. Set them up and watch the results. At first you may laugh at the silliness of this experiment, but when you experience the results and think about the implications, then your views will change. If you are cynical about the results and don’t believe it, then the only thing I can say is, try it for yourself. What if it does work? What have you got to lose? I will send you the instructions on how to setup and perform the experiment. Once you have the jars set up, take a photo and send it to me. I will post the “start” photo with your name and location on the Rice Experiment Results page. On a daily basis, you will talk to your two jars. Instructions are in the email. Once you are satisfied with the results send me a photo of the two jars. I will post it next to your first photo on the Results page. I’m genuinely interested in all theories about why this experiment works. Tell me your’s. It’s free. Your name and email are safe. I respect your privacy and will never spam you or share your information. You can unsubscribe at anytime.